Quote: On another note, I may have mentioned that one of the reasons for living in Somaliland, East Africa, this year is that I am helping to set up an English Language Department at the Edna Adan University, which is associated with the Edna Adan Hospital. The university runs degree and diploma courses for health care professionals in a part of the world where there is one doctor to 46,000 people. One of the challenges is that all the courses are taught in English, but the level of English among students is at elementary/pre-intermediate level. For this reason, we are strengthening and expanding the English Department and setting up a teacher training programme. 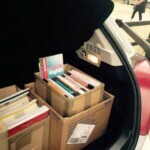 We were happy to help and encourage any school to donate old books for Africa too.